Have you ever tried to wish for someone to “change” ? And yet feel that the other person would not do anything unless that genuinely came from her ? 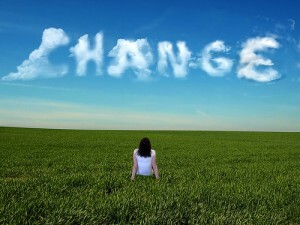 And at work, managers asking one of their team members to change, or do things differently ? And believe that, because they are the managers after all, that would happen instantly ? From the work of Gregory Bateson, Robert Dilts, a Californian psychologist, built an elegant model for thinking about personal change, learning and communication that brings together ideas of context, levels of learning, and perceptual positions. Logical levels form an internal hierarchy in which each level is progressively more psychologically encompassing and powerful. Logical levels separate the action from the person’s identity. A person is not defined by his behaviors or his skills. 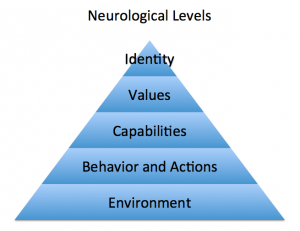 In the way our brain works, there are natural hierarchies or levels of experience. For instance, people speak of responding to things on different ‘levels’. Someone might say that an experience was negative on one level, but positive on another level. People intuitively have a feel for these internal hierarchies. Changing something on a lower level could affect the upper levels; however changing something in the upper levels would necessarily change things on the lower levels, in order to support the higher level change. Bateson noted that it was the confusion between thinking on different logical levels that often created problems for people. Values. What’s important and why? Includes world-view, categories, comparative values. Capabilities. My capabilities. States, strategies, and meta-programs. Do. What I do, or have done. Specific behaviors and actions. Once someone changes at one level, all levels down are positively affected. And changed in a sustainable way. Consequently, working on a team’s values, identity or vision will align all levels below and result into higher engagement and performance. And Ecological Leaders will increasingly need to develop similar approaches to foster higher levels of engagement within their teams. What about you ? Is that something you are using ? Consciously or intuitively ? With others or even for yourself ? 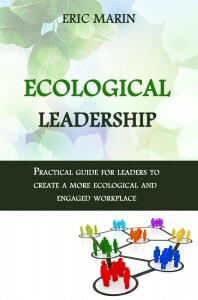 This post is adapted from topics discussed in the “Ecological Leadership” book.